Born in March 1995 as Suicide, the band changed its moniker to ERESIA, turning from Punk to Death Metal without compromise. The band has focused on the choice to sing in Italian. Since 1996, ERESIA have played a lot of shows, including supporting act of bands such as DISTRUZIONE, TANKARD, NOVEMBRE, MARDUK, WHITE SKULL, and many more. The band’s discography counts a demo released in 1998 and two full lengths, “Parole al Buio” (1999, unpublished) and “Moto Imperpetuo” (2001), which became a collector’s item while receiving enthusiastic reviews and excellent sales. 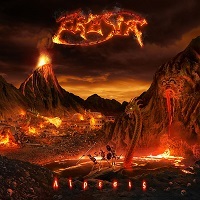 Despite many line-up changes, ERESIA continued to play and after months of hard work, the band finally completed its discographic comeback, “Aìresis”. Composed of four re-arranged and re-recorded songs taken from “Parole al Buio” and also contains two unpublished live songs. Let us see what this Italian Death metal trio has in store for us, shall we? Track one, “Dahmer,” begins with a live insert from the serial killer’s murder trial. When the music kicks in, it sounds more like 80’s thrash. It holds more of early SLAYER musically, but the vocals give off more early CANNIBAL CORPSE. The transitions are tight throughout and the solo throws hints of Kerry King. The seven and a half minute track ends with the man himself, which is fitting. “Parole al Buio”, has a crazy hook that sinks into your lip and drags you through murky water. The song still sounds more thrash, but the vocals still hold true to their Death metal tone. Even though I cannot understand Italian, the music is very entertaining. “Habitat Brutale” starts very fast and hard. It only eases for a few seconds before the pace kicks back up. It is a full throttle song made for moshing. For almost five minutes, I could see myself in a pit thrashing with all of the battle vested warriors. The live version of “Fragile” gives off a bit of what it is to hear the band live. I kind of hope it isn’t what I hear though. The vocals overpower the music too much. Perhaps it is just poor recording, but the guitars and drums seem too low. It isn’t the quality of the mix in previous tracks and it saddens me to think their live show is like this. “Eresia” is only a thirty-six second sample of thunder and bells. It leaves me to wonder why this didn’t lead off the album. These are the types of inserts that are expected at the beginning of an album, and it doesn’t lead well into the following track “Es”. “Es” is more of a speed song and when led by its predecessor, you expect something slow and dark to come into the fray. The fast licks kind of destroy the vibe you were hoping for. “Ultima Notte,” track nine, has this really catchy hook. You can hear more of that Death metal the band is going for here. The speed of the song has its highs and lows that only keep you listening the entire five minutes. This song is my favorite from the band because it holds surprises you wouldn’t expect. Everything just flows together unlike any of their other songs. “Airesis” is a fifteen track experience. With tracks such as “Acrono” and “Metamorfosi” helping end a really decent album, the last half seems better than the first. It gives off more of what you would expect from a Death Metal band. The only qualm I have is that it is all sang in Italian. I really wish I knew what message the band is about and could understand more lyrically. Overall, I would recommend it to anyone who is into the Death Metal scene.